Macarius II can also refer to Pope Macarius II of Alexandria and to Macarius II of Antioch. Metropolitan Macarius (Russian: Митрополит Макарий, secular name Mikhail Andreyevich Nevsky, Russian: Михаил Андреевич Невский; October 1, 1835 in Shapkino, Vladimir Governorate, Russian Empire – March 2, 1926, Kotelniki, Moscow Governorate, Russian SFSR, Soviet Union) was the Metropolitan of Moscow and Kolomna from 1912 to 1917, an outstanding missionary and enlightener of the masses in the Altai region (people used to call him the "Siberian pillar of Orthodoxy" and "Apostle of the Altai"). Born to a family of a sexton, Macarius graduated from a theological seminary in Tobolsk (1854) and joined the Altai Mission, which had been set up by the Holy Synod with the purpose of converting the people of the Altay region to Christianity. In 1861, Macarius took monastic vows and was ordained a hieromonk (monastic priest). From 1861 to 1864, he was busy restoring the Chulyshmansky Monastery to a normal state. In 1868-1869, Macarius lived in Kazan and worked on the grammar of the Altai language, publishing a number of divine service books in this language. In 1883, he was appointed head of the Altai Holy Mission and raised to the dignity of archmandrite, and then consecrated as Bishop of Biysk and vicar of the Tomsk eparchy. In 1891, Macarius was named Bishop of Tomsk and Semipalatinsk. In 1905, he became the Bishop of Tomsk and Barnaul (later, archbishop). 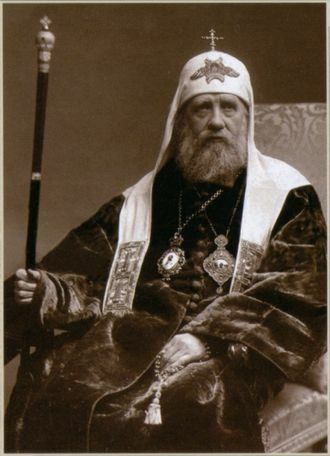 In 1908, Macarius was appointed Archbishop of Tomsk and Altay. In 1912, he was summoned to Moscow by the Holy Synod and elected Metropolitan of Moscow and Kolomna, also becoming thereby a member of the Holy Governing Synod. In 1913, Macarius became an honorable member of the St Petersburg Theological Academy. On March 20 of 1917, he retired from his post and was sent to Nikolo-Ugreshsky Monastery. Three years later, Metropolitan Tikhon bestowed upon Macarius the honorable lifelong title of Metropolitan of the Altai. 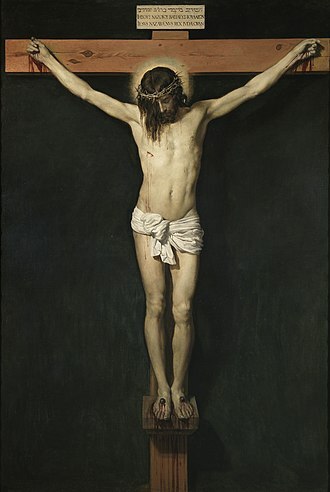 Macarius died in 1926. In 1956, Macarius' remains (still incorrupt, some[who?] say) were transferred to Sergiyev Posad and placed under the Dormition Cathedral of the Trinity-St. Sergius Lavra. Macarius II (Nevsky) of Moscow at OrthodoxWiki. Tobolsk is a town in Tyumen Oblast, located at the confluence of the Tobol and Irtysh Rivers. It is a capital of Siberia. Situated where the River Irtysh turns from flowing westward to flowing northward and it became the seat of the newly established Siberia Governorate in 1708 and prospered on trade with China to the east and with Bukhara to the south. 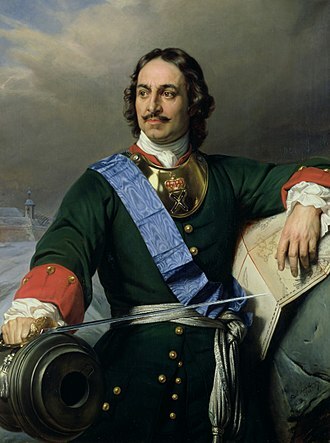 Tobolsk saw the establishment of the first school, after the Russians defeated the Swedish army at Poltava in 1709, large numbers of Swedish prisoners were sent to Tobolsk. 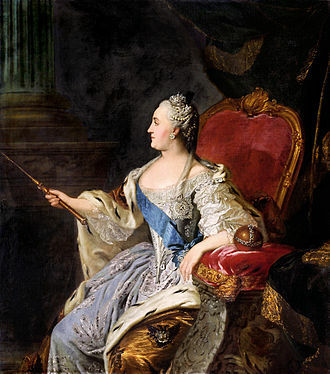 They numbered about 25% of the total population, many of them were not repatriated until the 1720s, and some of them settled permanently in Tobolsk. After administrative division of the territory, Tobolsk remained the seat of the Governor-General of Western Siberia until the seat moved to Omsk in the 1820s or 1830s. Acknowledging the authority of Tobolsk, many Siberian towns, including Omsk, Omsk continues to honor the legacy as of 2015. From 1796 until 1919, the served as the seat of Tobolsk Governorate. After 1825 some of the Decembrists were exiled and lived there as well, the towns relative importance declined when the Trans-Siberian Railway line between Tyumen and Omsk bypassed it to the south in the 1890s. 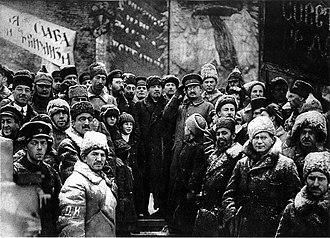 In August 1917, after the February Revolution, the Provisional Government evacuated Tsar Nicholas II, after a White Army approached the city in spring of 1918, the Bolsheviks moved the imperial family west to Yekaterinburg in the Urals and had them shot there in July 1918. Within the framework of administrative divisions, Tobolsk serves as the center of Tobolsky District. As an administrative division, it is, together with one urban-type settlement, as a municipal division, the Town of Tobolsk is incorporated as Tobolsk Urban Okrug. The economy of modern Tobolsk centers on a oil refinery. Some traditional crafts, such as bone-carving, are preserved, Tobolsk has a humid continental climate bordering on a subarctic climate. Winters are very cold with temperatures from −21.6 °C to −12.7 °C in January. Kolomna is an ancient city of Moscow Oblast, situated at the confluence of the Moskva and Oka Rivers,114 kilometers southeast of Moscow. Mentioned for the first time in 1177, Kolomna was founded in 1140–1160 according to the latest archaeological surveys, kolomnas name may originate from the Old Russian term for on the bend, especially as the old city is located on a sharp bend in the Moscow River. In 1301, Kolomna was incorporated into the Moscow Principality, like some other ancient Russian cities, it has a kremlin, which is a citadel similar to the more famous one in Moscow and built of red brick. The stone Kolomna Kremlin was built from 1525–1531 under the Russian Tsar Vasily III, in front of the façade stands a statue of Dmitry Donskoy, celebrating the gathering of his troops in Kolomna prior to the Battle of Kulikovo in 1380. The civic arms of Kolomna were granted by Empress Catherine II, the similar appearance of the arms, despite there being no connection between the Roman family and the city of Kolomna. Due to sensitive military production of components, Kolomna was a closed city until 1994. It is still not listed as a city of the Golden Ring, despite its kremlin, within the framework of administrative divisions, Kolomna serves as the administrative center of Kolomensky District, even though it is not a part of it. As an administrative division, it is incorporated separately as Kolomna City Under Oblast Jurisdiction—an administrative unit with the equal to that of the districts. As a municipal division, Kolomna City Under Oblast Jurisdiction is incorporated as Kolomna Urban Okrug, Kolomna is located on the Ryazan line of the Moscow railroad,116 kilometers from Moscow. In Kolomna, there are five stations and one terminal. Two bus terminals are located in the city, public transport in the city is represented by tram and city bus lines. Kolomna is situated on three rivers, and has passenger and transport berths, most known one is the Bochmanovo berth. The Kolomna Speed Skating Center is an ice speed skating oval used for Russian. In several of the autocephalous Eastern Orthodox churches and Eastern Catholic Churches, the patriarch or head bishop is elected by a group of bishops called the Holy Synod. 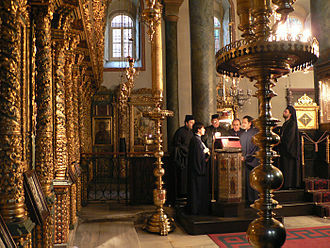 For instance, the Holy Synod is a body of the Georgian Orthodox Church. In Oriental Orthodoxy the Holy Synod is the highest authority in the church and it formulates the rules and regulations regarding matters of church organisation and order of service. 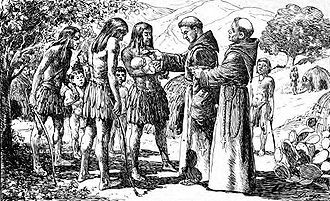 The principle of summoning a synod or council of ecclesiastical persons to discuss some grave question affecting the Church goes back, of course, to the very beginning of her history. Since the day when the Apostles met at Jerusalem to settle whether Gentile converts were to keep the Old Law, the Most Holy Synod or Most Holy Governing Synod was a congregation of Orthodox church leaders in Russia. It was established by Peter the Great, Stefan Yavorsky and Feofan Prokopovich in January 1721 to replace the Patriarchate of Moscow and it was abolished following the February Revolution of 1917 and replaced with a restored patriarchate under Tikhon of Moscow. In modern Russia the Holy Synod of the Russian Orthodox Church is the highest governing body of the Russian Orthodox Church between Sobors and it is headed by the Patriarch of Moscow and all the Rus. The first other Orthodox Church to imitate the Russian Government by synod was that of Greece, the national assemblies of free Greece in 1822 and 1827 began the process of making their Church independent of the Ecumenical Patriarch of Constantinople. In 1833 the Greek Parliament formally rejected the authority and set up a Holy Directing Synod in exact imitation of Russia. After much dispute the patriarch gave in and acknowledged the Greek synod, since then, the Church of Greece has been governed by a Holy Synod exactly as was the Church of Russia. A law in 1852 regulated its rights and duties and it met at Athens under the presidency of the Metropolitan of Athens. Four other bishops were appointed by the Government as members for a year by vote, the members took an oath of fidelity to the king and government. 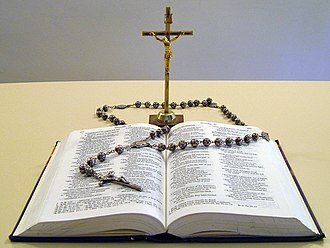 It is used as one purely title of honour, with no connection to any actual monastery, and is bestowed on clergy as a mark of respect or gratitude for service to the Church. This particular sign of respect is given to those priests who have taken vows of celibacy. Distinguished married clergy may receive the title of archpriest, when the supervision of monasteries passed to another episcopal official—the Great Sakellarios —the title of archimandrite became an honorary one for abbots of important monasteries. Initially in some cases it served as a title, for example. 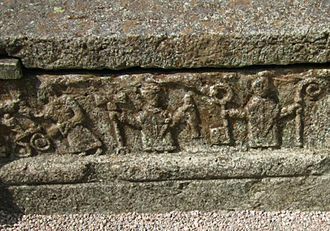 Abbots of third class monasteries were to be styled hegumen, the Russian Orthodox Church commonly selects its bishops from the ranks of the archimandrites. An archimandrite is a priest who has taken vows and is theoretically in line to be ordained a bishop. Sometimes the requirement is waived if the priest can show outstanding achievement in academic fields. An archimandrite who does not function as an abbot has the style The Very Reverend Archimandrite whilst one with abbatial duties uses the style The Right Reverend Archimandrite and this article incorporates text from a publication now in the public domain, Hugh, ed. Barnaul is a city and the administrative center of Altai Krai, located at the confluence of the Barnaulka River and the Ob River in the West Siberian Plain. At the end of 2015, the city had a population above 700,000 people, the population of the Barnaul metropolitan area is estimated to be more than 1.14 million. Barnaul is located in the forest steppe zone of the West Siberian Plain, on the bank of the Ob River, at the confluence of Barnaulka. Barnaul is the closest major city to the Altai Mountains to the south, the border with Kazakhstan is 345 km to the south-west. It is 3580 km from Moscow, the city is situated relatively close to the border with Mongolia and China. The area around the city has been inhabited by humans and Denisovans. They settled here to take advantage of the confluence of the rivers, used for transportation, in the late BC millennia, the locality was a centre of activity for Scythian and various Turkic peoples. The city of Barnaul was founded in 1730, and granted the status of a city in 1771. 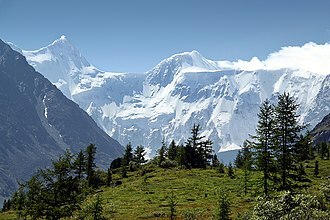 Chosen for its proximity to the mineral-rich Altai Mountains and its location on a major river and they wanted to develop the copper in the mountains, and soon found substantial deposits of silver as well. In 1747, the Demidovs factories were taken over by the Crown, Barnaul became the center of silver production of the entire Russian Empire. In 1914, Barnaul was the site of the largest draft riot in Russia during World War I, there were more than 100 casualties from the fighting. Street fighting took place between White Russians and Reds during the Russian Revolution of 1918, Maria Stepanovna was born and lived as a child in this city. She became the mother of American actresses Natalie Wood and Lana Wood and her father Stepan was killed in the 1918 street fighting between the Whites and Reds following the Revolution. Afterward her mother took Maria and her siblings as refugees to Harbin, Maria married a Russian there, and they had a daughter Olga together. 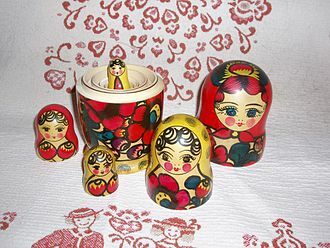 Maria eventually immigrated with Olga to the United States, where she married another Russian immigrant, from Vladivostok and it is estimated that over half of the light ammunition used by the Soviet Union in World War II was produced in Barnaul. Kazan is the capital and largest city of the Republic of Tatarstan, Russia. With a population of 1,143,535, it is the eighth most populous city in Russia, Kazan lies at the confluence of the Volga and Kazanka Rivers in European Russia. The Kazan Kremlin is a World Heritage Site, in April 2009, the Russian Patent Office granted Kazan the right to brand itself as the Third Capital of Russia. In 2009 it was chosen as the Sports capital of Russia, in 2015, Kazan was visited by 2.1 million tourists, which is a 20% increase in comparison with 2014. The Kazan Kremlin was visited by 1.5 million tourists in 2015 and hotel, the origin of the name Kazan is uncertain. The most accepted legends derive it from the Bulgar word qazan, one legend claims that the city was named after the river Kazanka, which was named after the son of a Bulgar governor dropped a copper cauldron into it. Other local legends, including research by the Tatar scholar Shigabetdin Marjani, if there was a Bulgar city on the site, estimates of the date of its foundation range from the early 11th century to the late 13th century. It was a border post between Volga Bulgaria and two Finnic tribes, the Mari and the Udmurt, another vexatious question is where the citadel was built originally. The oldest of these seems to be the Kremlin, if Kazan existed in the 11th and 12th centuries, it could have been a stop on a Volga trade route from Scandinavia to Baghdad. It was a center, and possibly a major city for Bulgar settlers in the Kazan region. Kazan became a center of a duchy which was a dependency of the Golden Horde, two centuries later, in the 1430s, Kipchak descendants of Genghis Khan, such as Ghiasetdin of Kazan, usurped power from its Bolghar dynasty. Some Tatars went to Lithuania, brought by Vytautas the Great, in 1438, after the destruction of the Golden Horde, Kazan became the capital of the powerful Khanate of Kazan. The city bazaar, Taş Ayaq became the most important trade center in the region, craft-based manufacturing thrived, as the city gained a reputation for its leather and gold goods, as well as for the opulence of its palaces and mosques. The Trinity Lavra of St. Sergius is the most important Russian monastery and the spiritual centre of the Russian Orthodox Church. The monastery is situated in the town of Sergiyev Posad, about 70 km to the north-east from Moscow by the leading to Yaroslavl. The monastery was founded in 1337 by one of the most venerated Russian saints, Sergius of Radonezh, early development of the monastic community is well documented in contemporary lives of Sergius and his disciples. 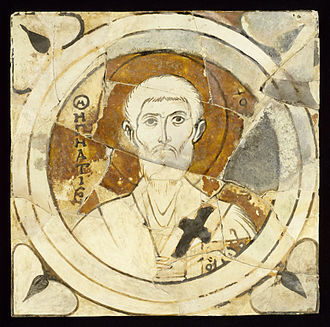 In 1355, Sergius introduced a charter which required the construction of buildings, such as refectory, kitchen. This charter was a model for Sergius numerous followers who founded more than 400 cloisters all over Russia, including the celebrated Solovetsky and Simonov monasteries. St. Sergius supported Dmitri Donskoi in his struggle against the Tatars, at the outbreak of the battle, Peresvet died in a single combat against a Tatar bogatyr. The monastery was devastated by fire, when a Tatar unit raided the area in 1408, St. Sergius was declared patron saint of the Russian state in 1422. The same year the first stone cathedral was built by a team of Serbian monks who had found refuge in the monastery after the Battle of Kosovo, the relics of St. Sergius still may be seen in this cathedral, dedicated to the Holy Trinity. The greatest icon painters of medieval Russia, Andrei Rublev and Daniil Chyorny, were summoned to decorate the cathedral with frescoes, Muscovite royals were baptized in this cathedral and held thanksgiving services here. In 1476, Ivan III invited several Pskovian masters to build the church of the Holy Spirit and this graceful structure is one of the few remaining examples of a Russian church topped with a belltower. 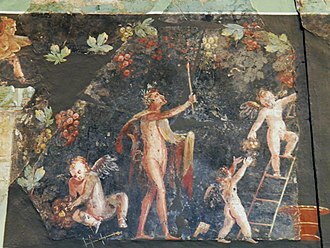 The interior contains the earliest specimens of the use of glazed tiles for decoration, in the early 16th century, Vasily III added the Nikon annex and the Serapion tent, where several of Sergius disciples were interred. It took 26 years to construct the six-pillared Assumption Cathedral, which was commissioned by Ivan the Terrible in 1559, the cathedral is much larger than its model and namesake in the Moscow Kremlin. The body of Mary of Jesus de León y Delgado, Monastery of St. Catherine of Siena found to be incorrupt by the Catholic Church (Tenerife, Spain). Relics of Anthony, John, and Eustathios at the Orthodox Church of the Holy Spirit in Vilnius, Lithuania. 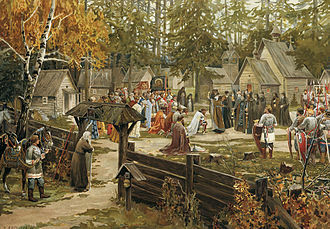 Sergius of Radonezh blessing Dmitri Donskoi before the Battle of Kulikovo depicted in a 1907 watercolor on paper by Ernst Lissner. Siege of 1608–1610: Orthodox monks led by the chronicler Avraamy Palitsyn defended the monastery against Polish troops from September 1609 to January 1611. 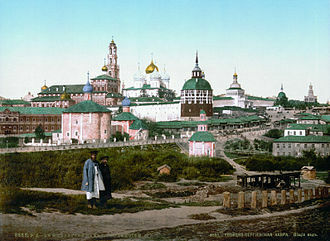 View of the lavra in the 1890s. The participants of the Extraordinary Meeting of the Holy Synod on July 26, 1911 in the main hall of the Metropolitan Housing in Alexander Nevsky Lavra.